The Overberg Renosterveld Conservation Trust consists of a small team of passionate and highly qualified people working to conserve the remaining fragments of Renosterveld in the Overberg. The ORCT is governed by a small Board of Trustees and run on a day-to-day basis by the Director of the Trust. Dirk holds a BSc (1986) and Honours (1989) degree in Agriculture. He is a successful commercial farmer in the Heidelberg region (eastern Overberg) and own two adjacent farms: Voorstekop (his family farm) and Uitvlugt. Voorstekop was awarded the National Veld Trust Award owing to the care Dirk and his father took of the entire environment on the farm. Over the years, various botanists have visited Dirk’s farm and through this he became exposed to a whole new world of rare and special organisms growing on his land – something that completely changed the way he saw his Renosterveld. Dirk has now registered the Renosterveld and Lowland Fynbos habitats on his farm (±500 ha) as a Nature Reserve (Voorstekop Eco-Reserve) through a Stewardship contract with CapeNature. Originally inspired by his father’s passion for the natural environment, Dirk is a forward-thinking individual who is serious about conservation (no till) farming and the protection of biodiversity. Dirk feels strongly that farming today needs to take all aspects of the farm into consideration and that managing for biodiversity is as important as managing for successful crops and commercial gain. Lesley has a BSc in Dietetics (1975, University of KZN), an Honours in Community Health (1984, UCT) and an MSc in Epidemiology (1990, Univ Stellenbosch). She first worked in the field of community health and nutrition for 15 years in both government and non-government organisations. In 1992 she moved into the conservation sector, joining CapeNature for 2 years and thereafter WWF South Africa to promote sustainability through programmes which integrated human health, community development and the conservation of natural resources. She has a solid base in management, programme planning and implementation, communication and fundraising, the latter both locally and internationally. A WWF College course in Conservation Leadership completed in December 2001 provided her with a wide set of skills in areas that are increasingly important in conservation such as conflict resolution, negotiation and campaigning. 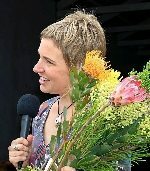 In 2003 she joined Flower Valley Conservation Trust as the Executive Director and has headed up the Trust for the past 9 years to develop it into a catalytic and innovative organisation in the Fynbos conservation and development sector. Sean (MSc Botany, UCT) is a botanist, Director of the Grootbos Foundation, Founder and Chairman of the Walker Bay Fynbos Conservancy and a Trustee of the Flower Valley Conservation Trust. Sean has 15 years of experience working in practical conservation implementation and sustainable livelihoods development on the Agulhas Plain. He runs the Green Futures Horticulture and Life Skills College, as well as Growing the Future sustainable agriculture projects at Grootbos Nature Reserve. He is also an eco-tourism operator; a botanical and conservation consultant, specialising in botanical surveys and management plans in the Overberg; and a Fynbos restoration specialist. Sean has written the definitive guide to the flora of the Walker Bay region and is also a consultant to Fauna and Flora International in the Cape. Sean brings experience in biodiversity based business, NGO governance and livelihoods development to the ORCT. Prof Muthama Muasya holds a BSc in Botany & Zoology (Moi University, 1992), an M.Phil. in Plant Taxonomy (Moi University, 1993) and a PhD in Systematics (University of Reading, 1998). He has extensive postdoctoral experience in England (Royal Botanic Gardens Kew), USA (Rutgers University) and Belgium (KU Leuven) as well as research experience at the National Museums of Kenya. Since 2006 he has held an academic position at UCT, with research focus on the cosmopolitan plant family Cyperaceae, as well as other aspects of the Cape and African Flora. He is an NRF-rated researcher, has published over 100 scientific outputs (journal papers, conference proceedings, book chapters), successfully supervised postgraduate students and regularly examines theses, and has served in national and international committees and panels. He is currently a member of the Fernkloof Nature Reserve Advisory Board. He has wide experience, networks and good standing within the biodiversity research and conservation fraternity. Odette holds an MSc Zoology (2005) and a PhD (2013) in Botany from the University of Cape Town (UCT). Odette has authored or co-authored eight scientific papers and 14 popular articles. She was invited as a Leadership Intern to Hawk Mountain Sanctuary, Pennsylvania USA for two months in 2005. Odette managed the Black Harrier & Black Sparrowhawk Projects from 2000-2006 at UCT; undertook a pilot study on gamebirds in Renosterveld (2007) and was contracted by CapeNature’s Stewardship Programme from 2007-2011; as well as having initiated research on Renosterveld management from 2007-present (funded by WWF from 2007-2011). Odette has been a board member of the Breede-Overberg Catchment Management Agency since 2007; a committee member of the Fynbos Forum since 2009; a committee member on the Western Cape Field Trial Club (for pointers) since 2001 and served as committee member of the Botanical Society’s southern Overberg branch (2009-2011). Odette’s interests include photography, horticulture & gardening, travel (Europe, southern Africa, Israel, India, USA), gundog field trials & bird watching. Odette has discovered at least three new plant species in Renosterveld, two of which has been named after her. Her strengths as a manager lie in good communication, organisational and management skills. She is passionate about Renosterveld conservation and initiated the Overberg Renosterveld Conservation Trust. Odette lives in Napier, Western Cape, South Africa. Sharon has worked as an Executive PA for many years in both the legal field and corporate world. She also ran her own cake-making/decorating business from home for a number of years. She is a newcomer to the ORCT, but is thoroughly enjoying working for Dr Odette Curtis and being involved in Renosterveld conservation. She is passionate about animals and is involved in animal rescue, in particular Greyhound rescue. She loves spending time with her pack of rescue mutts and hounds. She also bakes delicious healthy treats and cakes for dogs. Jannie is no stranger to Renosterveld and the ORCT. As part of his MSc in Conservation Ecology at the University of Stellenbosch, he looked at the biodiversity and ecology of the Critically Endangered Rûens Silcrete Renosterveld in the Buffeljagsrivier area near Swellendam. This veld type is sensitive to overgrazing and grazing at certain times of the year. He examined the effects of different grazing regimes on Renosterveld plant and insect communities. During this study he recorded more than 400 indigenous plant species, of which at least 30 were of conservation concern and a total of 214 insect families in 23 insect orders. He even identified a new plant species, Haworthia groenewaldii. If Jannie is not in the field identifying any living Renosterveld organism, you can find him at home with his Aloe collection of more than 230 different types. He also loves collecting and growing calabash and other interesting members of the pumpkin family, especially heirloom, rare or indigenous varieties. He grew up in and around the Renosterveld and can’t really remember when his interest in ecology and conservation started, but he knows that he can’t see himself sitting in an office. He would love to continue doing what he does best, being a remarkable naturalist. Rob is Director of FFI’s Africa Programme, which comprises a portfolio of about 40 projects based in 14 countries. Rob has overseen FFI’s support of the conservation of the Cape Floral Kingdom through several local partners in the Overberg district of the Western Cape over the past 10 years, including the Flower Valley Conservation Trust and the Agulhas Biodiversity Initiative (ABI). Rob read Zoology at Oxford, studied the behavioural ecology of naked mole-rats in Tsavo NP for his doctorate and has been a rhino conservation specialist since 1986. He has served as part of the senior staff of two wildlife authorities as Coordinator of the national Rhino Conservation Programme for the Kenya Wildlife Service (KWS) and Senior Wildlife Biologist in the Botswana Department of Wildlife and National Parks (DWNP). Before joining FFI in June 2004 Rob coordinated a regional programme for IUCN on rhino conservation in ten southern African countries under the umbrella of the Southern African Development Community (SADC). Charlie is a writer, botanist, and business person interested in plants, life’s journey, landscapes, arts & history, cultures, cats to “own” and dogs to love and futures thinking. He has been active in numerous Trusts and charities. He is a Non-Exec. Director of the St. Vincent Group Ltd. – a Property and fund management company and the Matara Gardens of Wellbeing – a social enterprise. Charles’s skills and competencies include fundraising, mentoring, strategic planning, and scientific and general management. He has managed or stimulated a number of multi-million pound visionary projects in Wales and England. As the Founding Director and CEO of the National Botanic Garden of Wales, a £50 million Landmark Millennium Project completed on time and on budget, he brings considerable experience to the service of the Trust. Prior to this he was Deputy Director & Director of Science at the Royal Botanic Gardens Kew and before that a Chief Professional Officer at the Botanic Research Institute (South Africa), as well as Associate Professor at the University of Natal (Pietermaritzburg). He is an enthusiastic and successful public communicator. He is listed in People of Today 2012 and Who’s Who 2012 and has an Honorary Doctorate of Science from the University of Glamorgan for his contributions to Botanic Gardens. He is currently an Honorary Research Associate (2007-present) at the University of Cape Town and a past Mellon Foundation Mentor (2007-2009). He is the author of four books and 130 scientific publications on weeds, arid plants, plant nomenclature, botanic gardens, conservation, economic botany, plant taxonomy, Amazonian and Mediterranean plants, history, pollination ecology, history, ancient wisdom, philosophy, natural history, and the plant families Leguminosae and Verbenaceae. Charles was born in Pietermaritzburg (South Africa) and has lived in the UK since 1978. Chris’ conservation career has spanned nearly four decades and has included management of protected areas in the catchments of the Drakensberg, Cedarberg and Langeberg as well as oversight of management of Nature Reserves such as De Hoop and Dyer Island as well as leadership of conservation extension teams. He was a key figure in establishing the Grootvadersbosch and many other Conservancies. Chris went on to establish and manage the Stewardship programme for Cape Nature and continued to provide invaluable insight to landowners in this area and across the Western Cape. Based in Stanford, he is now the Managing Director of a company trading as the Fynbos Trust which enables and supports Landscape Scale Conservation in the Overberg.